Learning how to properly use punctuation is an important part of improving reading and writing skills. 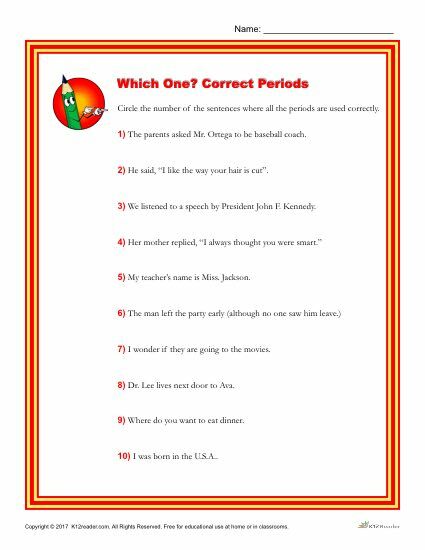 In this printable worksheet on ending punctuation, students will be asked to circle the number of each sentence that correctly uses a period. For example, the following sentence does not use puctuation properly: The parents asked Mr Ortega to be the baseball coach. In this sentence, the period after “Mr” is missing. Students will practice this on their own as they work through the activity found below. It is ideal for 3rd – 8th grade, but can be used where felt appropriate. To download and print the worksheet and answer key, click the link below.